On October 25, 1939, Clifford Joseph Touchet, well-known Cajun musician, was born in Nunez. In the early 1940s, his family moved to Kaplan. Because neither of his parents spoke English, French was the first language that he learned to speak. He did not learn to speak English until he entered school. At the age of thirteen, Touchet began to listen to Cajun music on the radio and he started singing in French. Touchet began playing the guitar when he was seventeen after a friend gave him a guitar because he did not know how to play it. Touchet taught himself how to play rhythm by writing the keys down on paper. In 1969, Touchet began playing in a Cajun band with Clyde Hebert and the “Kaplan Playboys.” In the mid-1970s, he started his own band called “Cliff and the Melody Playboys.” They played dances throughout Acadiana, including Lafayette, New Iberia, Patterson, Cecilia, Forked Island and Kaplan. At first he began playing only French music, but today he also enjoys playing Swamp Pop and Country. Touchet has played with many well-known musicians such as Aldus Roger, Belton Richard and Milton Adams. Today, he attends jam sessions almost every week and helps to promote and support young Cajun musicians. 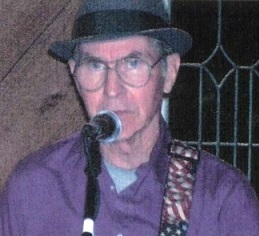 Touchet has been playing rhythm guitar for 52 years and singing for 56 years. Not only does he enjoy playing the guitar, but he also enjoys making the instrument.